Our November Bride of the Month is Katie Crosland-Harris. Katie is such a cute girl and was amazing to work with. Her bright rose letterpress invitation suite was elegant and really reflected her personality! Bekka: How did Talon propose? Katie: Talon proposed to me by blindfolding me, driving me around the Holladay area, and taking me out snowshoeing in a blizzard...still blindfolded may I add. I remember how freezing it was when he had me get out of the car, while he put my snowshoe gear on for me. It was quite the climb at first and then very steep. After a couple of minutes he allowed the blindfold to come off. After my eyes adjusted to the brightness of the sun off the snow, I recognized that we were at the Waterford school, where we first met. We hiked around the campus until he sat me down with view of the soccer field, where I played all of my high school games. After overcoming his nerves, sharing a few reasons why he loves me, he got on one knee and asked me to marry him with ring in hand. He tried to help me up, but that wasn’t so easy with snowshoes on. So we had a great laugh and enjoyed this special moment in our journey together. Bekka: After the initial excitement where did you start when it came to planning your wedding? Katie: My mom and I headed to Scenemakers to meet with our wedding coordinator Allie Kesler. We made a few rough plans with her and I shared the vision I had for the big day! Bekka: How did you decide on what your invitation would look like and what inspired it? Katie: This decision was a difficult one. My inspirations were the time of year and the flowers that would me in my bouquet, and my favorite color. With the help of Ann Elizabeth, I was able to create the perfect invitation. Bekka: Did you have a favorite part of your invitation and was there any feature of your invitation that people complimented you on most? Katie: I love the design with the rose letterpress on multiple parts of the invitation. Bekka: Do you feel that your invitation with vibrant rose letterpress set the tone for your event? Katie: The invitation fit perfectly for the tone of my wedding. It was bright, fun, and very classic. Bekka: From your experience do you have any advice for brides who are looking to gather inspiration for their wedding invitation and were there any lessons you learned through your creative process? Katie: I would make a list of “must haves” before meeting with Ann Elizabeth. This will help the narrowing process a lot! It is overwhelming to see all of the choices she has because she is so talented! Bekka: You were married and sealed in the historical Salt Lake City Temple with the reception held at the beautiful home of your parents. Tell us more about why you chose the locations and what they mean to you? Katie: We chose to be married and sealed in the Salt Lake Temple for many reasons. Both of our families live in Salt Lake, the grounds are beautiful, and I grew up going to this temple with the desire to one day be married there someday. We chose to have the reception in my parents backyard not only because it is breath-taking, but because we wanted the party to feel like home for everyone! Bekka: No one can choose a favorite part of their wedding day so I wont make you, however was there anything that stood out more? 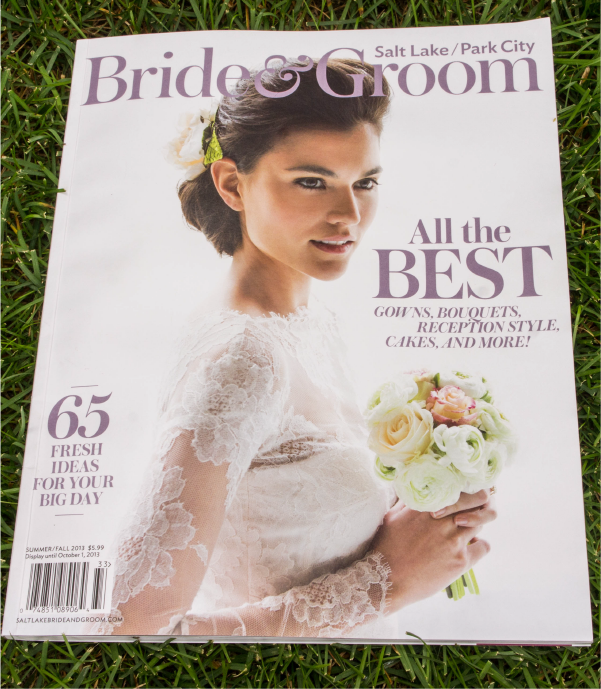 Katie: Standing on the Salt Lake temple steps with my closest friends and family, with my new husband by my side was a very special moment for me. That was a rare occasion I’ll cherish forever! Bekka: After all the hard work of planning your dream wedding did everything go off without a hitch or were there any hang-ups? Katie: Everything, even the weather, was perfect on the day of our wedding! Bekka: Katie again we are just thrilled to have you as our November bride and thank you for taking the time to share the details of your gorgeous wedding!